The winners of the 2018 Nov 6th Election turned out to be the exact match to our poll prediction. This was the first time a political poll was run here on 4boca. The results were pretty good. There’s a very simple reason why this poll turned out to be accurate. Read on to learn how accurate we were and how representative this poll was of the local and statewide population that voted. The Race For Florida’s Senator: Rick Scott Wins – 4Boca Called It! Rick Scott won last night by a small margin. This makes Governor Scott now Senator Scott. Given Florida’s economic condition and quality of life it was difficult for Bill Nelson to scare enough voters away from Scott. Nelson’s “healthcare scam” messaging felt like the pot calling the kettle black. Although our poll had a very wide difference between these two candidates, and the difference in votes was much smaller, our poll still called the winner correctly. The Race For Florida’s Governor: Ron DeSantis Wins – 4Boca Called It! Another race that was super-close yet had results that turned out identical to our poll was the race for Florida’s Governor where Ron DeSantis beat Andrew Gillum. The ideological differences between the two candidates was wide, but Florida voters and our poll participants chose staying with Florida’s values, not changing them. The change that Gillum represented resonated with younger people and did result in a genuine Blue Wave, but in reaction it caused a Red Swell, a Storm Surge against progressive castles made of sand. The Race For Boca’s US Congressman: Ted Deutch Wins – 4Boca Called It! The interesting thing about Ted Deutch, a winning part of the Blue Wave, was that he was neglected by Obama who campaigned so vigorously for both Nelson and Gillum. There were few ads attacking Kimaz or promoting Deutch. Ted Deutch appeared at the Gold Coast Tiger Bay Club and impressed local influencers by setting aside half of his luncheon speech time for questions. He had to work for his win, which he did alone, and it paid off. Take a look at some photos from that event taken by Carol Porter and featuring club members and guests having a great time. The Race For The State House: Mike Caruso Wins – 4Boca Called It! Mike Caruso and Jim Bonfiglio are close (Caruso 50.2% v 49.8% Bonfiglio) with Caruso on top. It will be a close one, justifying a recount. But once again 4boca.com’s poll results matched the outcome. 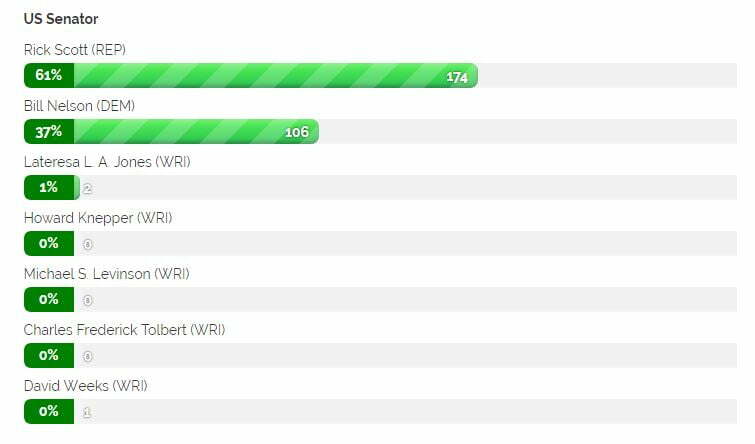 The Race For County Commissioner: Bob Weinroth Wins – 4Boca Called It! Billy Vale did not do bad against Bob Weinroth when you consider how strong Bob was and has been as a presence in the South County. The results of 53% versus 47% matched the actual vote outcomes of 54.3% and 45.7% closely. The Race For Attorney General: Ashley Moody Wins – 4Boca Called It! Another race whose results matched our poll was the race for Florida’s Attorney General. Ashley Moody won the seat with 52% if the votes, less than the 62% predicted by the 4boca.com poll. 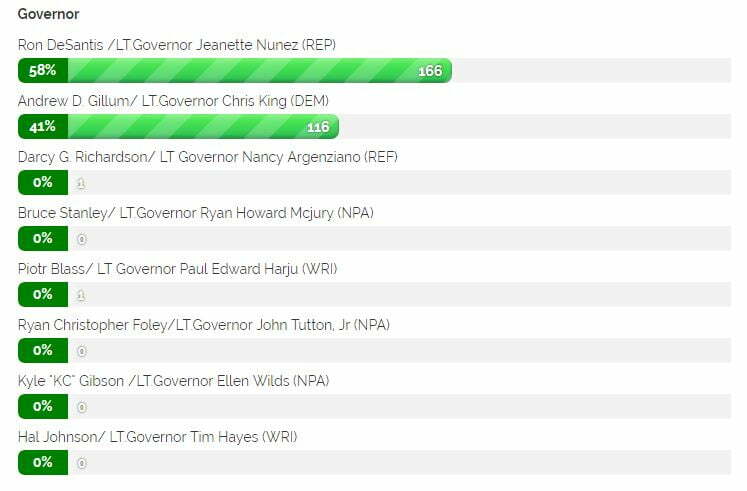 Brian Mast and Jimmy Patronis also came away as winners in their races for Congress and State CFO. Congratulations to them and all the other winners. Thanks go out to the participants who didn’t achieve victories but instead walked away with experiences that will helpfully be leveraged towards races in the future. Why Was This Poll Accurate? The results in this poll were compared to the overall winners, not necessarily for all voters. We didn’t look at the voting numbers that came exclusively from Palm Beach County. Those numbers on the Palm Beach County Supervisor of Elections site show different voting results than are discussed here. Comparing these 4boca.com poll results to those local results shows that the 4boca.com poll was not necessarily representative of the local voters in Palm Beach County as a whole for statewide races. However, despite the differences with locally measured votes this poll did call the winners for all 6 races it included. That’s a 100% accuracy rate, so far, for 4boca.com with regards to predicting the winners of races. Either something was done correctly or it’s beginner’s luck. One thing that wasn’t done in our poll was hiding the results until the poll was completed. Instead, for credibility sake, we instituted real time results sharing in combination with safeguards against participants voting multiple times. We had mechanisms that made bots think they were voting, but kept them from voting instead. But most of all there were no manipulations of the numbers performed by “polling professionals”. There was no adjustment of the percentages along the lines of guessing who “likely voters were”. The sampling was done through Facebook, targeting “local” people exclusively. Very little money was put into promoting the poll via Facebook’s ad model: Sponsored Posts. The majority of the participants came from other participants sharing the poll and this author sharing the poll to local Facebook Groups dealing with politics and community affairs. It was just the raw results and a sample set just large enough to yield working confidence. It shouldn’t be rocket science to get polls right. Getting this 4boca.com political poll promoted on Facebook wasn’t easy. Initial attempts to Sponsor (pay for) it to be promoted to a wide audience on Facebook got rejected. Facebook had decided that the subject matter of this site dealt with issues of “national importance” so it applied a new degree of scrutiny to these attempts. This author had to receive written verification codes by mail, send in a Drivers License photo, and link a cell phone to the Facebook Page. This is part of Facebook’s new effort to weedle out “Russian Bots” from influencing elections. Posts that are Sponsored for candidates now appear with a “Paid for By ___” disclaimer within the post next to the message that disclaims the Post as being Sponsored. This makes sense for voters who have to be informed whose money is going towards the promotion or trashing of a candidate or their opponent. This makes sense for things that are biased towards one candidate or party. It seemed wrong to put the same disclaimer and validation constraints on this site’s effort to promote a poll. There was no intent to promote or advocate for any candidate or party whatsoever. And still we were treated as if we were. The two major print publications to the north and south, Palm Beach Post and Sun-Sentinel, do endorse candidates and are transparent about taking sides in the nature of their coverage of candidates, but don’t seem to have that same need for disclaiming their Sponsored Posts about politics. That seems inconsistent at a minimum.